Endodontics is the name given to a specialised field of dentistry that is concerned with the inner workings of the tooth. Endodontists are usually dentists who have decided to specialise in this field and have taken additional training to become qualified. Root canal therapy is one of the most common dental treatments in the field of endodontics. General dentists are usually qualified and quite able to perform root canal treatment but certain circumstances may arise where the dentist will refer you to an endodontist. It may be the case that your first root canal treatment was not successful and the expertise of an endodontist is required. It could be that the dentist does not feel suitably qualified to perform the treatment on certain teeth that have a more complex anatomy, such as the back molars. Whatever the reason, if you have been referred to an endodontist it means your dentist is concerned with the welfare of your teeth and wants you to be in the best hands. Root canal treatment is the largest procedure in the field of endodontics. Depending on the number of teeth undergoing treatment and the location of the teeth, it can be a complex procedure. Root canal therapy will be needed when the pulp tissue of the inner tooth becomes infected. This can be caused due to infections such as periodontal disease or it can be caused by decay to the tooth. The tooth will then need to be drilled and the bacteria and tissue will need to be removed. The root canal that has been cleaned will then be filled and sealed. Depending on the tooth, there may be only one canal to be cleared or there may multiple canals in the one tooth. The alternative to endodontic treatment will usually be tooth extraction. The advancement in the field of edodontics means that it has now become a recognised field of dentistry in its own right. Over the years the technology used in the field has advanced and highly sophisticated equipment is used in all endodontic procedures. X-rays are still needed in order to diagnose and fully assess the extent of damage to the inner tooth, but digital radiography is now used and this has 70 percent lower radiation levels than traditional x-rays. The accuracy of the endodontic instruments has also increased over the years in order to give the best possible care. Fibre optic illumination along with tiny video cameras mounted on microscopes will give more detailed images of the tooth than has ever been previously possible. The length of the root canal can now be gauged down to 0.5mm due to the use of sophisticated apex locators. Ultrasonics are also used in the endodontics department that ensure accurate location and preparation of the root canals. 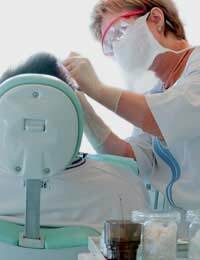 After root canal treatment the endodontist will send all records of the operation back to your own dentist. There may be further restorative work needed, and this can be performed by your regular dentist. Once the treatment has taken place it is rare that any follow up work will need to be performed by the endodontist. Although it is quite possible for a dentist to perform routine root canal treatment, the edodontist will be there to perform the more complicated root canal work. If your dentist has referred you to an endodontist it is nothing to worry about. The dentist is simply making sure that your teeth get the best attention possible; your dental health is your dentist’s first priority.